Welcome back to my review of last year’s fashion. This time I’m going to share a couple of redesigns that turned out well (they may work for you too! ), the fashion hit that was on all the runways which created happiness for many, older forgotten pieces that earned new love this year, and some of the newer items in my closet that already feel like old souls. Isn’t it curious how you can find something new that feels like a friend from a past life? I had at least three of those. I want to start with a couple of items that have been in my closet for years and years and came out this year like they’d been reborn. I come across this sheer blouse every spring when I pull it out. It’s gone years without being worn once in the whole season. I think of letting it go and then I save it once again. This year I pulled it out and it felt perfect over my Chico’s white tank and jeans. It filled a great purpose: hanging out with Russ on Sundays in Sonoma. The way I feel right now, it will be the first thing I grab when I switch out my closets again. It’s been with me for 12 years and counting! 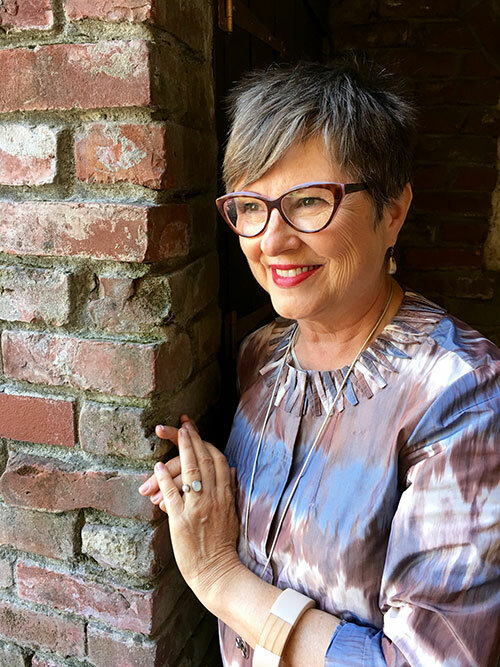 Pop over here to learn why I thought this black sheer top should go over a column of white. What’s not to love about this little jacket? I ask myself. I don’t know, was it the fit? Did I never really figure out how to wear it? Maybe it just needed this very year when I fell back in love with the look of white shirts and jackets. 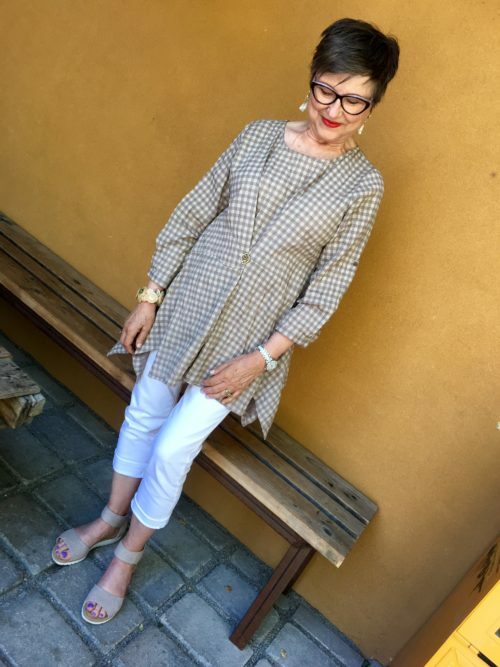 When I couldn’t make magic with this gray linen jacket I sent it off to a consignment store. One day I got a call to come pick it up. It hadn’t sold. When I pulled it out this summer it still had the tag on it from the consignment store. How funny it felt to be pulling a tag off of it again! I feel chagrined that I tried to get rid of this jacket! 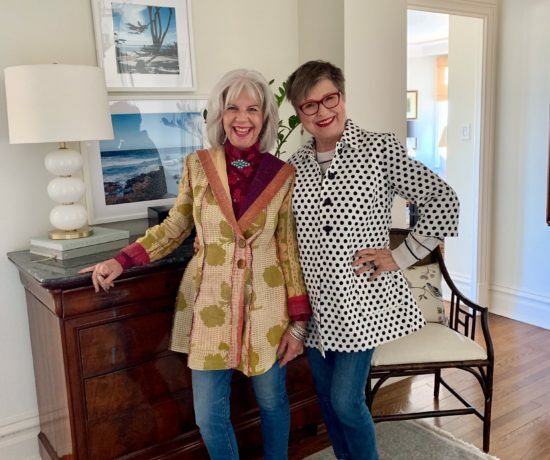 I was with my daughter Erin when I purchased this jacket in a boutique on Fillmore Street in SF. It had pants that went with it. I decided the matching pieces weren’t my thing and let the pants head off to a consignment store and another owner well before I sent the jacket off. Now I regret that move. I lost a few pounds this year which is probably one reason I enjoyed wearing the jacket–it just fit better. Now I bet I would have LOVED wearing the matching pieces. Oh well, it’s a jacket that came back to me and I’m happy it got its due this year. In this category, there were some items that I loved but they had problems that made me not choose them. If something isn’t being worn, I start thinking about editing them out for good. I looked more closely at each item to see if there was a way to keep them in my wardrobe with an adjustment or two. Shazam! I’d nearly given up on this cardigan that seemed so useful but I never wore it because I was fiddling with it all the time. Then I thought about closing it up so it wouldn’t slip and slide. What I did was go into my brooch/pin collection and pull out my owl pins. I used them as closures to give the buttons they covered more visual appeal. I LOVE the outcome! 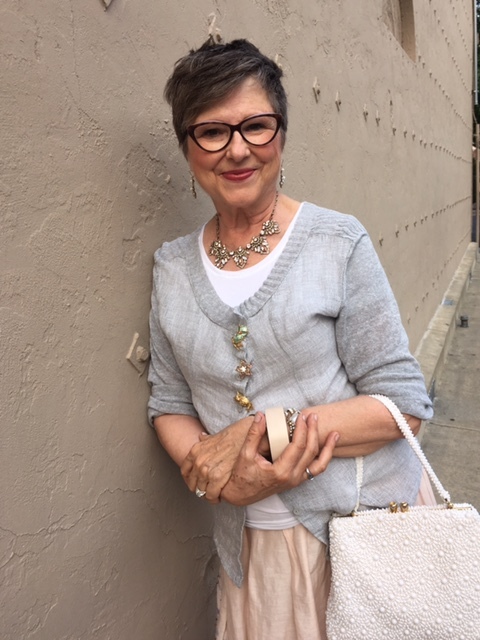 Here’s the post that talked about this Fashion Fairy Godmother Makeover highlighting this outfit. There was something just not right about this tunic this year. It’s very comfortable to wear and perfect in hot weather. But this year it looked baggy and too big. I didn’t want to let it go; I love the print and the color. It was begging for a fix. Again, the solution came with a pin. I created an inward pleat and used a pin that belonged to Mother as a way to get rid of the volume. Now it was also accessorized. Pretty nifty, right? If you want to know more about this resizing tip, read on here. This Chico’s necklace seemed like a slam-dunk purchase but it wasn’t. Every time I put it on I felt like I’d lost my sense of style. I felt matronly! Really! But one day I worked hard at it and figured out what was wrong. It needed to be shorter, by quite a lot. I had no patience to take it to a jeweler to shorten it. I wanted to wear it NOW. I took matters into my own hands and within 10 seconds I’d solved the problem. To read about my ten-second fix, enjoy the original post here. 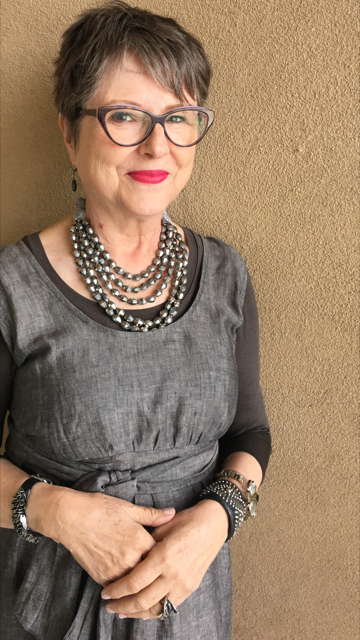 I love the glistening gray of the necklace. 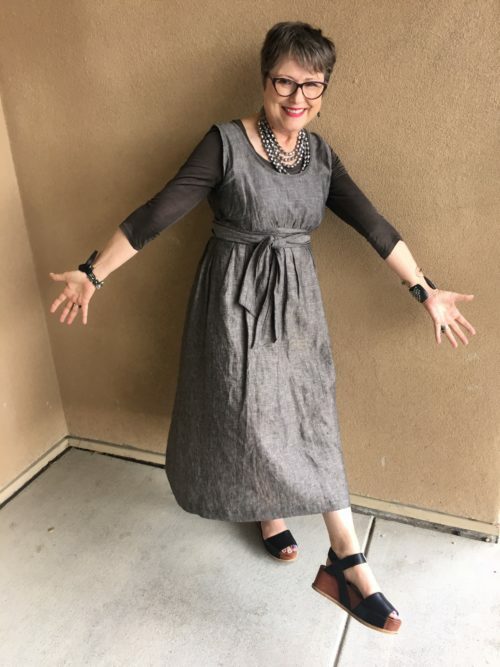 It was perfect when I wanted to fill in the neckline of this glistening gray linen dress. I added a few pieces to my wardrobe that felt like they couldn’t possibly have NOT been in my wardrobe already. They became instant old friends. Let me tell you about them. This pant silhouette was brand new to me. I’ve been in skinny jeans and narrow pants for years! But these wide leg pants are so entertaining with every step. I walk and they respond with a swish, swish, swish against my legs. They found an instant home in my wardrobe and updated my look. 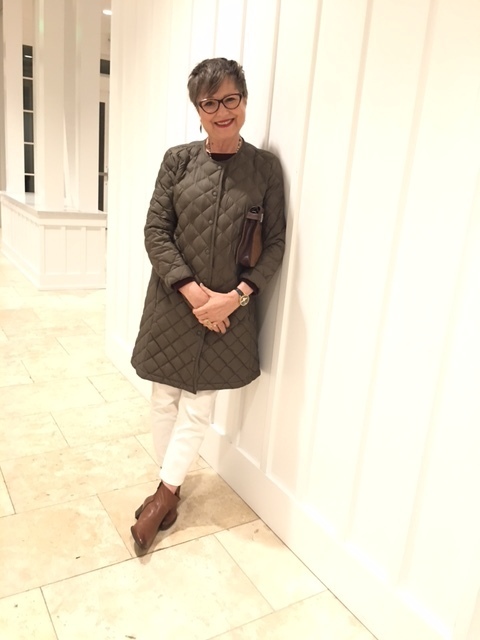 Okay, I’m going to tell you all the ways this J.Jill lightly quilted jacket serves me. I first started wearing it as a jacket. Duh, right? It’s the perfect weight for me. It’s lightweight but it cuts the chill when you need it. But here’s the unorthodox way I wear it. I want to sleep in a chilled room. I don’t like heat at night. So what do I grab when I’m sitting up in bed reading or watching Netflix before slumber? Yes, this jacket…over my pajamas. It’s like its my bed jacket. Remember those from the old movies? When I’m done reading I slip it off but put it over a basket of books near my bed. In the morning the house is chilled so I grab it and slip it back over my pajamas. I love the chill of the morning and hate putting the heat on right away. I then open the bedroom door, have a conversation with Bella (meow, meow), and then make my coffee. I head to my writing table and do my morning pages with my cozy jacket still over my pajamas. And I love it! It’s my security blanket! This is truly a multi-purpose coat! Some days I wear it with a sweater and jeans and go out and about running errands in the city. Sometimes I put it on over an all-black outfit and wear it to see clients. 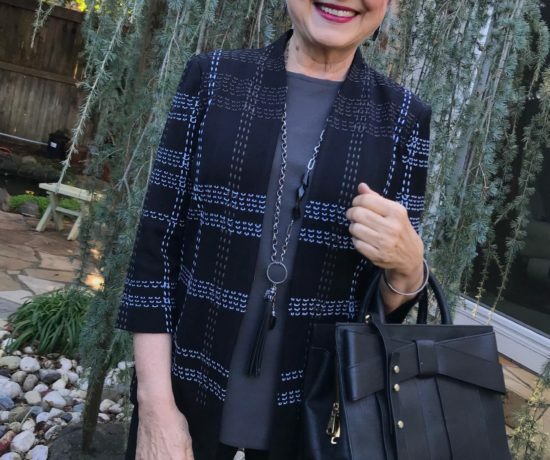 But now that you know the whole story, you’ll understand: there is nothing in my closet that does more things for me than this lightweight jacket. I first wrote about it here. It was on a most memorable night. When I slipped this coat on for the first time it was me. I knew it immediately. What was uncanny was that I had bought a similarly styled coat, left the tags on it, and it was idle in my hall closet. But this similar coat by J.Jill (long, gray, same weight of fabric) was the “YES, without a doubt” coat while the other one was the “it seems like this should work” coat. I do not wear this coat to sit in bed and watch Netflix. But every time I slip it on it feels oh so right! Moral of this fashion story: the right one is out there waiting for you. Hold out for the one that says YES! Here’s an interesting read about this Chelsea coat if you missed it the first time. It’s about the color gray, the different names for it, and why “ash” and “smoke” are currently not in my color vocabulary. This has been the year of stylish and comfortable sneakers! Oh my! At first I thought it would be mostly a look for young people. And then I put a client in them and it was a total game changer for her. It brought vitality to every outfit in her closet. It was modernizing. And isn’t it amazing that something that is high fashion is the biggest ally to people with finicky feet? Sneakers have comfort and style. What a combo. 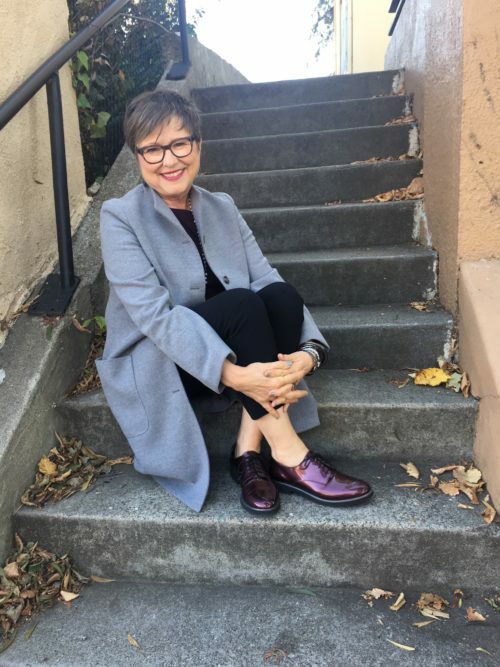 Here are some of the ways I wore sneakers. 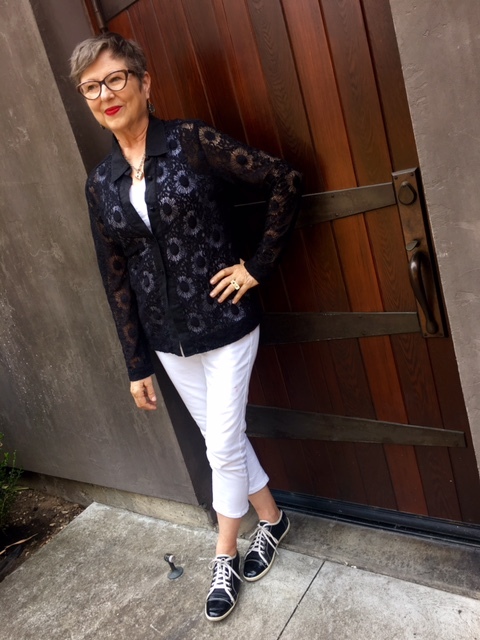 Read more if you want to hear why I think sneakers are the new ballet flats and you need a pair! So my dear friends, what adventures did you have with your clothes this year? Were there surprises? Did old things become new things again? Did you make an adjustment to a problem garment? We all want to know!! I always love getting feedback from Dominic! I love the choices you two made! It’s interesting seeing things through your eyes (and Dominic’s!). I think you’re being generous with the potato sack idea but I may have to just try that this year! To a great 2018! There are far too many outfits for me to have a fav out of your selections, but I have always said the sweater with the brooches and the tunic are choices of mine. Your brilliant idea of turning ‘under tops’ around is fantastic, and I have borrowed your idea. The linen jacket story represents my closet. There have be a few too many time I said”why did I get rid of that” and now I have a covered clothes rack in the basement for the maybe items. Then when I go back to an item I can make a decision. 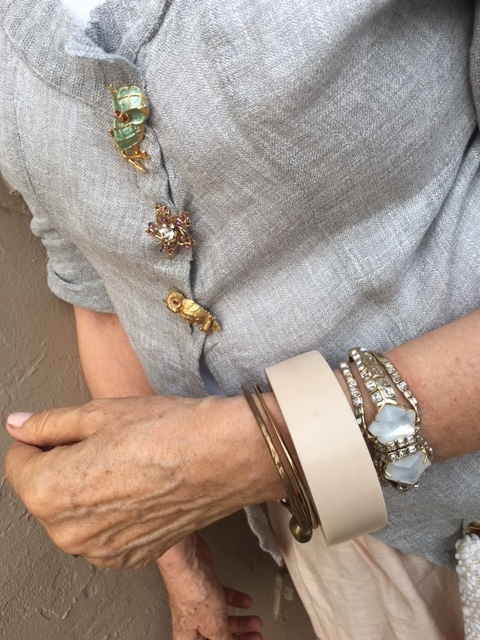 I make adjustments on jewellery quite often for a new look before deciding to retire an item, so love when you show how you change yours. I am so looking forward to seeing what you have in store for us this year. I smile when I picture you wearing your ‘bed jacket’, how cute. Cheers to a great 2018! Cheers to you, Diane, in 2018!!! We’ll make it a great year! All of your outfits are inspirational to me but the one that really stands out is the one with the polka dots. It makes me happy just looking at it on you. Surely it made everyone smile as they saw you glowing with personality when you passed them by. I really loved that outfit too. It was so fun to wear that jacket every time I did!!! I really like the lace top over the column of white! Can’t wait for spring to try it myself! I always get a lot of inspiration from your blog. Even if I don’t have the exact pieces, maybe a color combo will catch my eye or placement of jewelry or super cute shoes! Thank you for sharing your passion and creativity! It’s my pleasure, Cathy! I like getting inspiration from places. I often go to my client’s closet with visions in my head and then I create all new looks based on something I’ve seen. It’s a gift that keeps on giving! I live in the mid-west, a very traditional community. So we are behind trends by about two years. 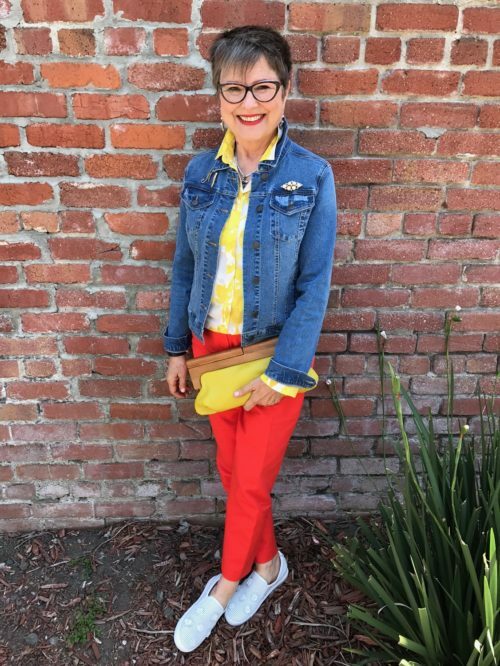 I did a “Brenda” and wore pants under my dress, I bought a pair of sneakers to wear (haven’t done it yet) and tried triple denim. 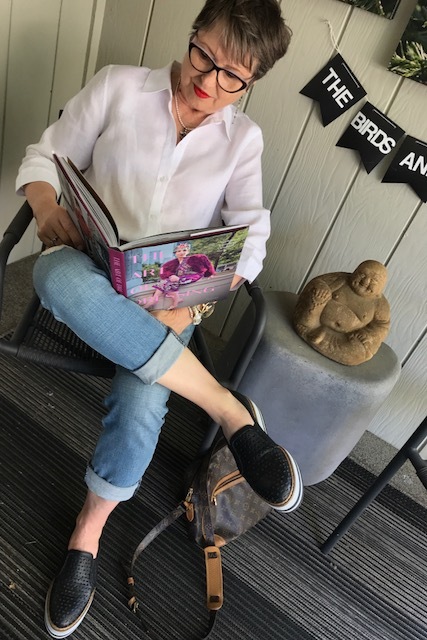 No body noticed or commented so I don’t know if that’s good or bad….I’ll let you know about the sneakers when I get a chance to get out of boots! It’s -3 here today! Keep inspiring us Brenda!! It sometimes takes people a while to “see” what they’re seeing. They may be too unsure of themselves to comment. I say be bold and try it again! And having experienced -11 as the high for the day, I know what you mean about boots! Happy New Year! Gosh, I love every single thing you spoke about. Such ingenious ideas to fix outfits! I love the sneakers, I love the brooches. Your style just matches my eye perfectly! So fun to hear that! I love following you and your style on Instagram. I always love what you do! 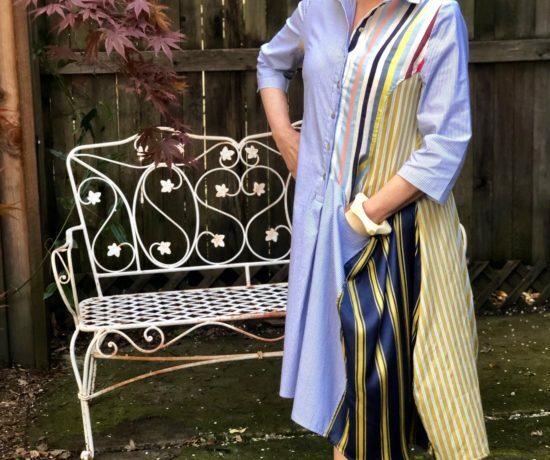 Nothing exciting to SHARE except I tried to wear CAFTANS night and day in summer…….IT WORKED! 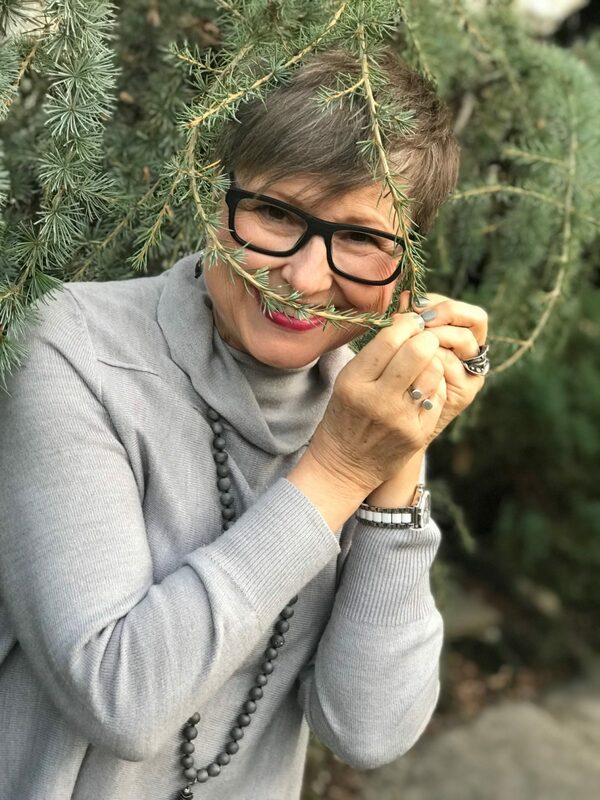 Let’s meet up soon in Corte Madera for a lunch and catch up! Would LOVE to meet up in Corte Madera. Let’s aim to make that happen within four weeks. How does that sound? My love of brooches continues. I must mention Pimlico Place in Oakland, CA. I expressed looking for a black velvet clutch that was plain so that I could pin on a brooch or two for custom embellishment. 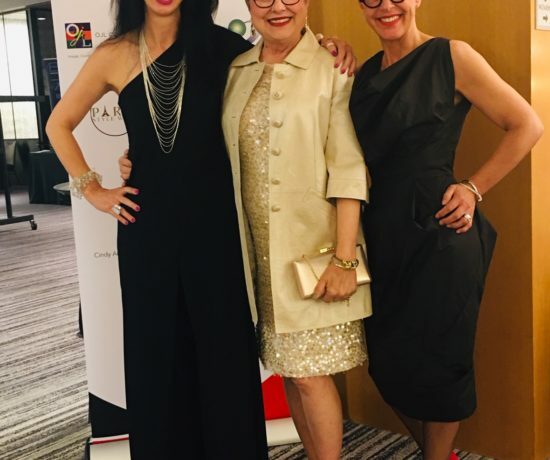 Fabulous Curators/Sisters, Annette and Julia found a vintage clutch for me. They get it! Their new hire, Holly suggested a pin lock available on Amazon. I had never heard of a way to lock a brooch other than sew it on. I am researching which version to try. There are a few choices. 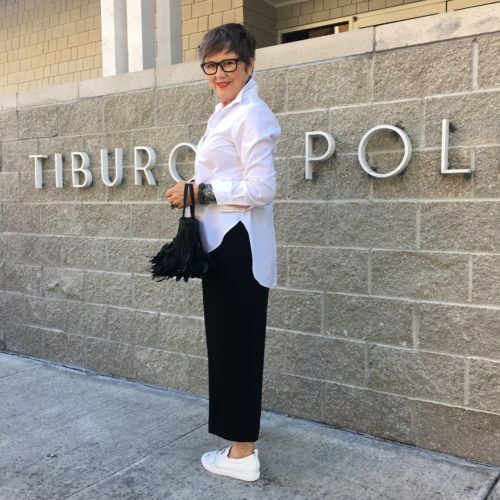 So, I hope this sequence shows a fashion inspiration and solution as well as a Tried and True Treasure Trove in Oakland–Pimlico Place on Piedmont Avenue in Oakland, CA. This store is a jewelry-lovers delight as well as featuring accessories galore. Thanks for the great tip about Pimlico Place! I need to do a field trip to Oakland. Love your creative mind! I’m really impressed with the tunic reduction. 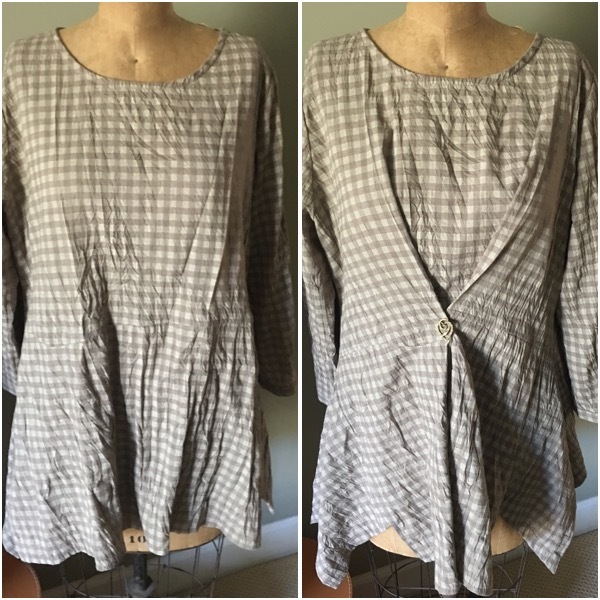 I love tunics but they can be shapeless, and if too long, can make my 5’ frame look frumpy. The brooch/pleat idea is genius, and I love that you used your mom’s stick pin! She is truly always with you. I have a couple of my mon’s Jewelry pieces that I have to try to wear more. By the way, I love the sandals you are wearing with the tunic! What brand are they? Are they comfy? Happy new year, Brenda, hoping for all good things for you. Keep the inspiration coming!! Thanks, Jacqueline! Yes, having those special Mom pieces with me really soothes my soul. I love her and miss her so much! Those sandals are great, very comfortable, wore them all summer long. They are by Gabor. I have another pair of Gabor shoes as well. I highly recommend trying them! 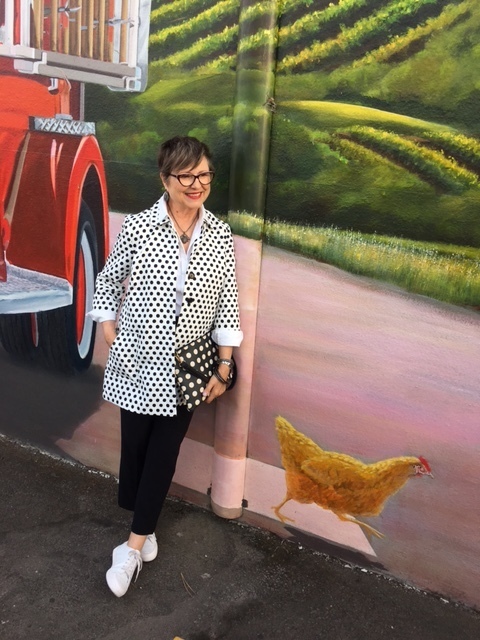 True confessions – I bought the Chicos polka dot jacket last summer after seeing it on your post, anf got many compliments on it. 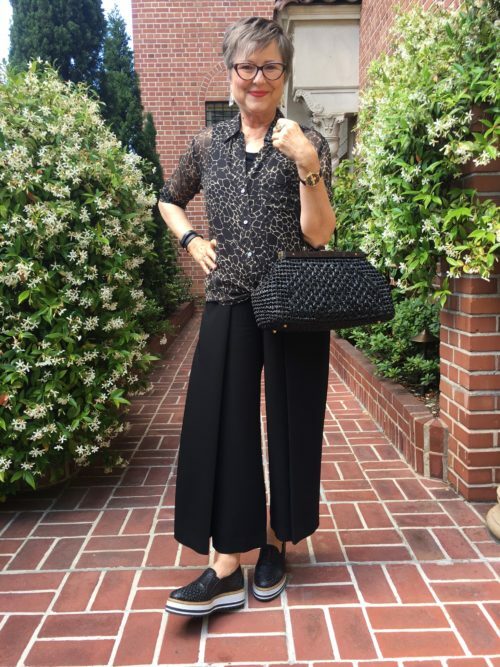 I also bought the black print pants you posted from JJill and had fun styling them with various tops and platform sandals. I wish that quilted jacket was still available, I looked at it before but now it’s sold out in my size. As always, thank fro the inspiration! 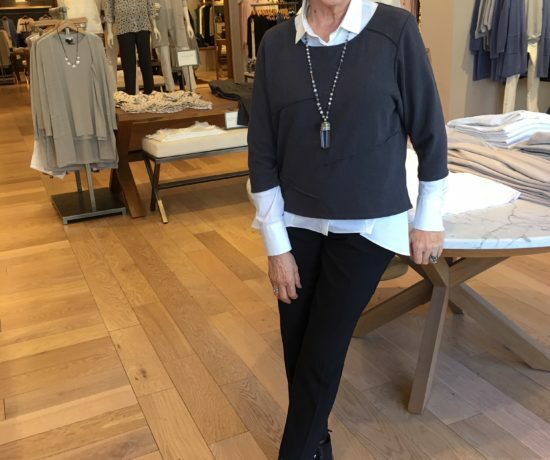 So thrilled that those pieces worked for you!!! We must have similar style recipes! 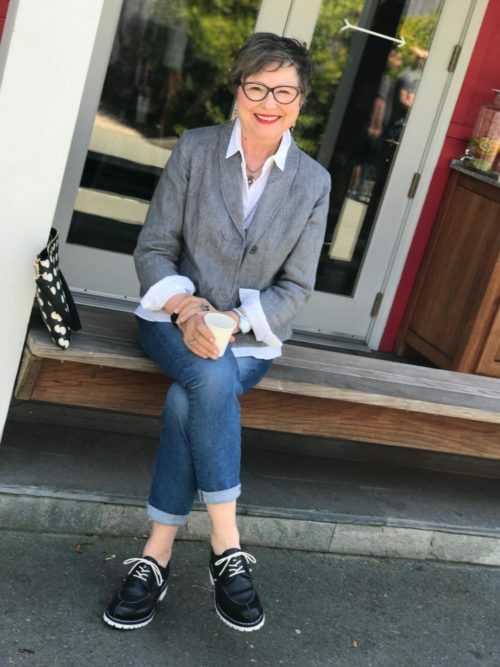 I love that gray linen jacket! It was meant to be with you obviously because it looks great on you. It took the second time around for me to understand exactly what you’re saying! I still think the trick you pulled with that tunic is pure genius!! So fun spending time with you guys! We need to meet up soon! Yes, it would be great! Was just thinking about you when my friend from the Central Coast called me to tell me about the birth of her grandchild–breach just like my two daughters. She was at my side when my daughter Erin was born so we were giggling at the deja vu! Anyway, when we see you in Paso we’ll be visiting her. Oh, gosh, so many plans we need to make! Such great outfit ideas. Especially the pinned tunic, amazing! I LOVE your blog and wait for it daily to show in my inbox! Question: What is the brand of the gray sweater you are wearing in the very first picture? I have been looking for something with a similar tunnel neckline. I think I love gray as much as you! I love these ideas—so glad I found your posts on Pinterest this morning. Looking forward to each and every one to come! Why thank you, Carol! And that’s what they’ll be doing: keeping on coming. Welcome! The sneakers are by Wellfeet or Wellfeat. Had them for years, not sure if they’re still around. Have a great trip, Kim! !